Gwalia is less than 3 miles from the famous River Dyfi. The eco-system of the Dyfi Valley is so significant that it has been granted UNESCO World Biosphere Reserve status. This has helped local people protect the landscape and to preserve and study the many species which live within it. 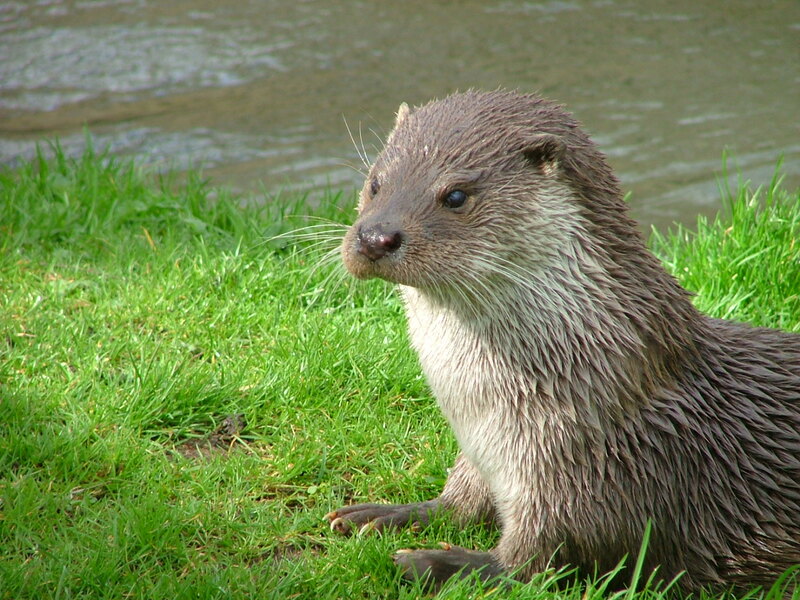 Otters are one of those rare and wonderful creatures which has set up home on the Dyfi. They are such a treat for those who manage to catch a glimpse but are famously elusive for those actually trying to find them. A local wildlife expert had told us that otters regularly patrol all the streams and tributaries to the Dyfi and one of these cuts through the heart of Gwalia so of course, there was always the chance that they were around. It was early one morning in January when it all happened. 7:45am and all was quiet. Amy’s Mum was up and about earlier than normal and was outside doing her usual morning chores whilst Amy and I were where we usually are before 8 o’clock, in bed. We heard a shout come from outside and thought Livy had fallen but no, what she was shouting was “OTTERS!”. Amy darted out first whilst I was still throwing some clothes on and grabbing my phone in case I could get a photo. Two otters were in the garden pond, not the stream or lake but the tiny little pond 3 meters away from the house! Amy’s arrival had startled them and they’d legged it, so by the time I got there they were both gone. Completely disappeared. I was gutted! All that remained was a half eaten frog. There were no guests in the Cabin that morning so with very little optimism I headed over to the cabin lake just in case they were there. In my mind of course I thought I’d see them splashing around but when I got there all I could see were the rain drops splashing on the surface of the water. With heavy heart I headed back to the house. But then…out of the corner of my eye…there it was. An otter. An actual otter. It was busy exploring the pools in the stream which runs immediately behind the cabin. We’ve been lucky enough to see otters several times in the Highlands but never this close. It was beautiful. Luckily I had my phone on me and called back to the house to get Amy and Livy over whilst I quietly shadowed it working it’s way up the stream. The three of us stood in silent awe, watching this magnificent animal, no more than 5 metres away. It looked at us as it munched it’s way through breakfast. The otter just didn’t care that we were there. We kept a respectful distance and in return it let us into it’s world for just a couple of minutes, completely unperturbed by our presence. The second otter was nowhere to be seen and after gracing us with it’s presence on dry land the otter ducked under water again and completely disappeared. The dull light of a winter’s dawn meant that I couldn’t get a photo but it didn’t matter. It was a magical moment which will stay with us all forever. This entry was posted in The Wild Side on February 8, 2016 by Dee.